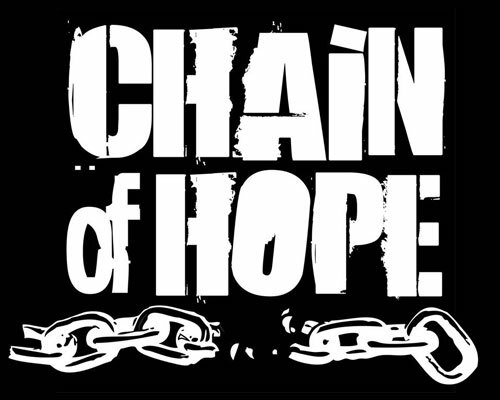 Chain of Hope received a call from a concerned woman who had just been to an auto salvage yard in Independence. She said that when the owner took her behind the business to get the part she needed for her car, she saw a pathetic dog in a 4 X 4 pen and it looked like the dog had mange. She said it was pretty bad and asked us if we could go check on him. Of course we would! I headed over to the salvage yard and introduced myself to the owner. He was very receptive and offered to take me back to see the dog. It was a large, black, older Shepherd with lots of missing hair, tumors all over, and a horrible smell. When I approached the pen, the dog was laying in his dog house with just his head sticking out, resting on his front paws. He just looked like he’d given up. I knew he didn’t feel good, because he didn’t even get right up to bark or check me out. After a few minutes, he did slowly get up and come out of his house. He barked at me quite a bit at first. I gave him a pig ear, which he went right to. The pen was small, but spotless-no feces at all. The dog had a bucket of nice, clean water. The man proceeded to tell me the dog’s story. He said that about 6 mo. ago, this dog just appeared in his salvage yard. At the time, the guy was not fenced in the back and the dog had wandered in. The guy said that he really didn’t want a dog. He walked the dog all around the neighborhood behind his salvage yard and knocked on doors and asked if anyone knew who the dog was, but no one did. He said he fed and watered him and then called a couple of shelters. When he described the condition of the dog, they said that they would most likely euthanize him. The man didn’t want that to happen, so he just let him hang out and kept him fed and watered. After a few months, he was able to fence the back of his property. He had never pet or touched the dog, but the dog would always follow him for food. I think the guy was maybe a little afraid of him, but nevertheless he made sure the dog had clean water and food everyday. He would coax the dog in the pen during the day when customers were coming in and out and then at night, he let him be free in the large yard. He knew the dog was not well and he showed me some homeopathic things that he had bought for the dog, trying to make him better. He told me that his family were strong believers in homeopathic medicine, so that’s what he had tried for the dog. He had good intentions, but nothing was really helping this poor old dog. I took some pictures of the dog and told the guy that I would have to try and find rescue for him or make space in our program somehow. I wasn’t sure what we could do. Of course we wanted to rescue him, but everyone always thinks that we can take every dog out of every situation, The truth is we can only rescue what we have space for. We do not have an endless supply of places to put all the dogs that need out of their situations. This is why foster homes are so important. Taking a dog into foster for us creates space for another dog that desperately needs to come into our program. Without more fosters, there is only so much we can do. 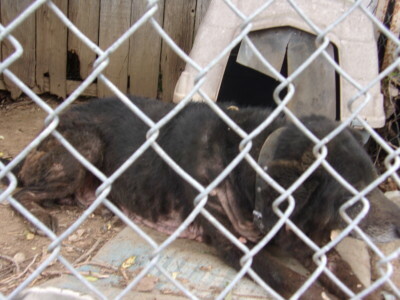 I left the salvage yard with a heavy heart, wondering how we could help this old boy. Two days later, Tanner and I went to get this dog out of there and get him into the vet. His skin was horrible, he stunk incredibly bad, he’d never been neutered, he had lots of little tumors and a couple of bigger ones. A couple of his teeth were broken. He was in rough, rough shape. We weren’t sure about his personality since no one had even touched the dog and he barked a lot the first day I saw him. We had hot dogs with us and quickly made friends with those. He loved them! We got him loaded into the van and headed for the vet. Hang on, help was on the way! His collar looked and smelled like it’d been on him for years-it was disgusting. By the time we were ready to leave the vet, the old man was smiling! He knew that he was being helped and he was feeling better already! He did not have mange. He had a severe yeast infection. He is on a couple of meds for this and has had 2 medicated baths so far. It is not contagious. He is heart worm positive, which didn’t surprise us. He has a very sweet personality. He loved being petted and talked to. It absolutely broke my heart to think that he hadn’t been pet or touched at all in the last 6 months, and I’m sure way longer than that. He was really very affectionate and began licking our faces. We didn’t care if he stunk so bad and was crusty and scabby, we loved on him anyway! Tanner named him Smokey and we took him to Chain of Hope. The owner wanted us to take him-it was all too much for him to deal with. Smokey didn’t seem to know about going up the stairs, so we had to coax him with some hot dogs. Tanner got to work on his skin and his coat. The pictures just can’t show the extent of his infected, weeping sores, the crustiness of his skin and that horrific smell. Tanner shaved the worst area and then gave Smokey a good, medicated bath and cleaned out his ears. Out in the sun to dry! We set Smokey up in my office. He was going to be our new office assistant for awhile. Here he is enjoying all kinds of treats! Smokey loves being in the office! He is getting very spoiled, which he totally deserves. He loves his big soup bones, frozen cheese bones, pig ears-anything yummy! I walked into my office the other day after being on outreach and Smokey was spread out, sound asleep on his cushy, soft bed. He didn’t even hear me come in. I stood there in the doorway for a minute, looking at him. He looked so peaceful, relaxed and happy. I thought had badly he had suffered to be in that bad of shape. He had suffered a long, long time. No one had loved him, at least not in a very long time. My heart ached for all he’d been through. I quietly thanked God that someone had cared enough to call us about him or no one would ever have known about him. I then quietly thanked God that Chain of Hope is out there and has the means to save lives like Smokey’s. Although it is so incredibly difficult, it is a privilege to carry on this mission. You have our deepest gratitude for enabling us to continue our difficult work. Thanks for putting this smile on Smokey’s face! He’s a happy boy now! Please let us know if you’d like to foster Smokey and help him through his recovery. 816-221-8080.